This Core design exists within a framework of socially driven integrated curriculum, and at a nexus between place based and international learning. Building a Networked Civic Culture for an interdependent world. An integrative and integrated curriculum enabled through eLearning in a series of new spaces for learning . The NLE is a powerful answer to the myriad of questions that face the failing infrastructure of the traditional school in the twenty-first century. Building on work and scholarship since 1904, NLE will seat its core design in the frameworks of curriculum integration. Most recently, the clearest voice for this visionary approach to learning is Dr. James Beane (retired Professor of Integrated Studies, National Lewis University). The following sections on curriculum integration weave the work of Beane (1997) and specifically his salient discourse in Curriculum Integration: Designing the Core of Democratic Education into the overall discussion. This approach to learning will be inherently learner centric. Integrated Curriculum: Young people involved and engaged in an enormous range of knowledge, from information to values clarification, and including content and skills from several disciplines of knowledge integrated in the context of themes and activities within them. Organizing centers are are significant problems or issues that connect the curriculum to the larger world. These centers serve as a context for unifying knowledge. Knowledge in turn is developed as it is instrumentally applied to exploring the organizing centers (Beane,1997). Integrative learning: Collaboratively planning a curriculum with young people (Beane, 1997). An integrative integrated core curriculum with problem[/passion] based central themes, and meaningful concepts to drive authentic activities where ideas are explored and acted on (Beane,1997). Addressing self concerns and ways of knowing about self (Beane, 1997). Addressing social and world issues, from peer to global relationships, and ways of critically examining these (Beane, 1997). Ways of investigating, communicating, analyzing, and expressing. Finding,Validating, Leveraging, and Synthesizing Information; Communicating, collaboration and problem solving in a technologically rich environment (Beane, 1997). The approach to learning embodied in an integrated and integrative curricular core will be intensified through nLearning. This nexus between highly student based curriculum and nLearning will provide the learning community with a new learning ecology. This ecology will embody the NLE vision as it allows young people and their communities both local and around the world to connect in authentic, effective and exciting ways. Project based and collaboration rich software will enable our learning spaces to have a flexible web 2.0 enabled system to work within the NLE’s many project based learning endeavors. Throughout our first year of operations and then on a continual basis, the whole community at NLE will find and validate new nLearning tools for the proliferation of our learning spaces. This integrative process will allow for young people to use and develop the technologies they see as integral to their learning. NLE learning ecologies will provide the frameworks necessary to utilize mLearning in expansive ways. Mobile Learning using, iPhones, netbooks, and other portable tools will offer the learning community a chance to take learning in highly dynamic situations to a new level. 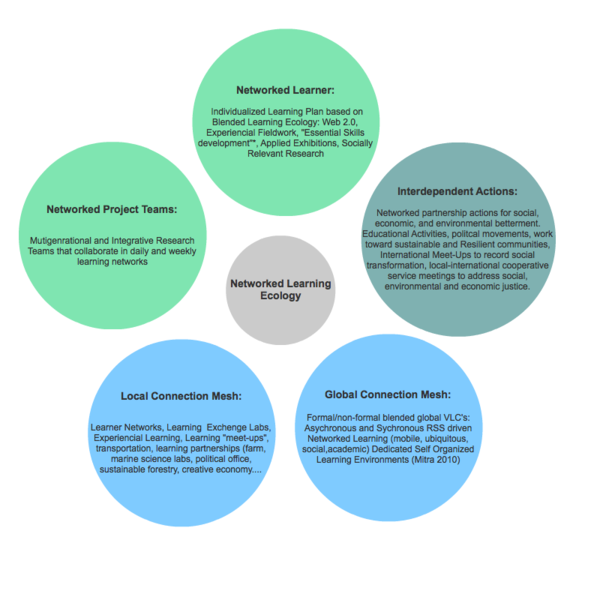 Networked ePortfolio (nPortfolio) assessment will be a way to weave assessment into the learning ecology as a learning tool. The design and flexible structures offered through the use of nPortfolios will enhance the learning spaces of NLE by allowing the whole community access to research and learning outcomes while at the same time providing a personal and learner centric environment for growth. NLE nPortfolio’s will provide the community with an in-depth look at student passion, interests, intelligences, growth, and accomplishment. Learners working via nLearning in project pods locally and internationally in blended learning settings. The core design of NLE organizing centers will emerge out of learner outcomes in Whole Learning Ecology (WLE) programs. WLE programs will be both integrative and integrated and serve as methods investigations in learning how to learn. Learning how to find, validate, synthesize, leverage, communicate, collaborate and problem solve. What is essential about the TCL’s is that the investigations will engage learners through a practice of relationship building. How to approach an interdependent world will be the focus of these sessions. Learners may be involved in active listening workshops, architectures of empathy workshops, or design and research methods courses. The goal of these investigations will be to ready IGCC participants for the innovative and world changing work they will do in their learning spaces and toward their organizing centers. ILC programming will emerge out of the special needs or interests of learners. This program is currently being created as a space for intensive individual study, travel, or invention/business creation outside of the organizing centers that will drive most of the learning spaces in the IGCC core. NLE will offer learners a chance to create their own authentic experiences through fully integrated organizational centers (OC’s). These OC’s will blend all of the NLE learning ecology together for projects that have lasting impact on the world. All of the OC’s designed will have real world application and deal with the issues of living in an interdependent world. The outcomes of these projects will meet not only the curricular needs of knowledge acquisition but apply all learning to the real world. The goal of all organizing centers is focused on integration of self into interdependent world systems for a sustainable future.